This isn't your average baked beans side dish that you just plop down as filler on your plate. These baked beans can stand on their own as they have many added flavors compared to your generic store bought canned baked beans. Though the smoked beef brisket and pulled pork are optional, we feel that these two ingredients really set these beans apart. Just plan to make these as a side the next time you plan to smoke a big cut of meat. 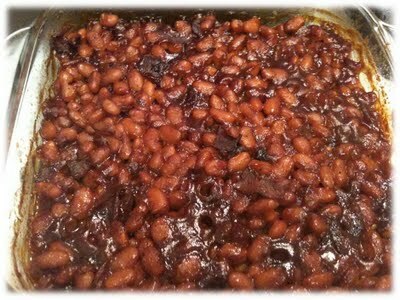 If you like bold flavors and hearty BBQ baked beans, you will love this recipe. Fry up your 4 slices of bacon on a skillet and set aside to cool. Cut your bacon slices into small pieces so it is smaller than bite sized pieces. Put your drained pinto beans and non-drained black beans into a 3-4 quart saucepan over medium heat. Add your bacon pieces, brown sugar, BBQ sauce, and small pieces of smoked beef brisket or pulled pork if you have it. Heat your BBQ baked beans to a boil and then turn them down to low to simmer. Let your BBQ baked beans simmer for 20 minutes to let all the flavors blend together.